The battery will give you longer runtime and will increase the power of your existing tools. It maintains full power and runs substantially cooler through heavy applications, allowing users to push their cordless tools harder and longer than ever before. 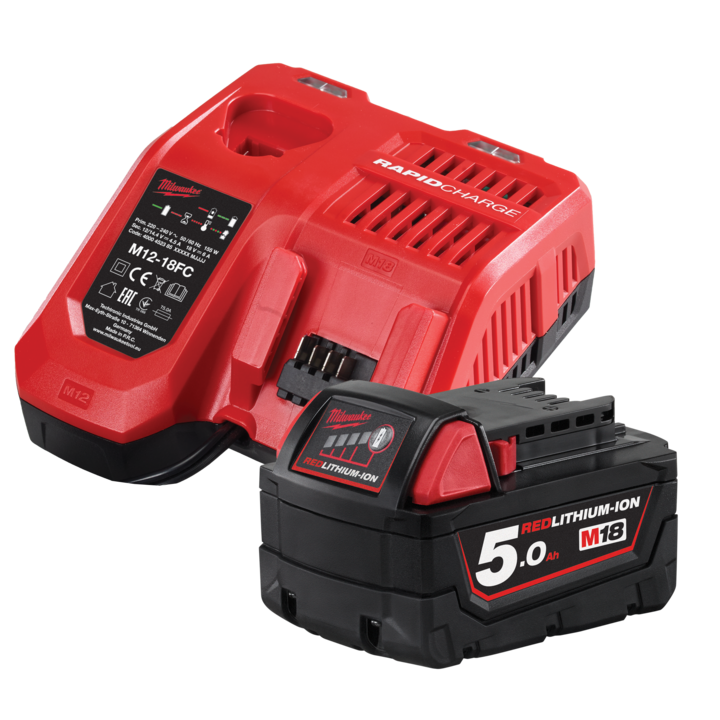 The M18 REDLITHIUM-ION 5ah battery is fully compatible with 60+ M18 tools. Suits both M12 & M18 batteries. The M18 & M12 Rapid Charger charges packs up to 40% faster than the standard M2-18C Charger , reducing downtime and maximizing productivity. Featuring REDLINK Intelligence, it communicates directly with the battery to monitor cell voltage, temperature, and charge status to optimise the performance and extend the life of the pack. As an added level of communication, the charger indicates when the battery reaches an 80% charge, providing confidence that a substantial amount of work can be completed without waiting for a full charge. By using a non-genuine Milwaukee fake or copied battery or chargers that may have been altered in anyway can cause faults with the REDLINK communication system between the battery and charger as well as between the battery and the tool. You also run the risk of a battery bursting that may result in personal injury and/or property damage, possible fire damage to the tool, the battery and/or the charger. These tools are guaranteed by the Authorized NZ Distributor against any defects in workmanship or materials. Defects in construction or operation not attributable to normal wear, overloading, abusive treatment or careless handling will be repaired without charge by any Authorized Milwaukee Service Agents throughout New Zealand or by our own On Site Technical Service Workshop.